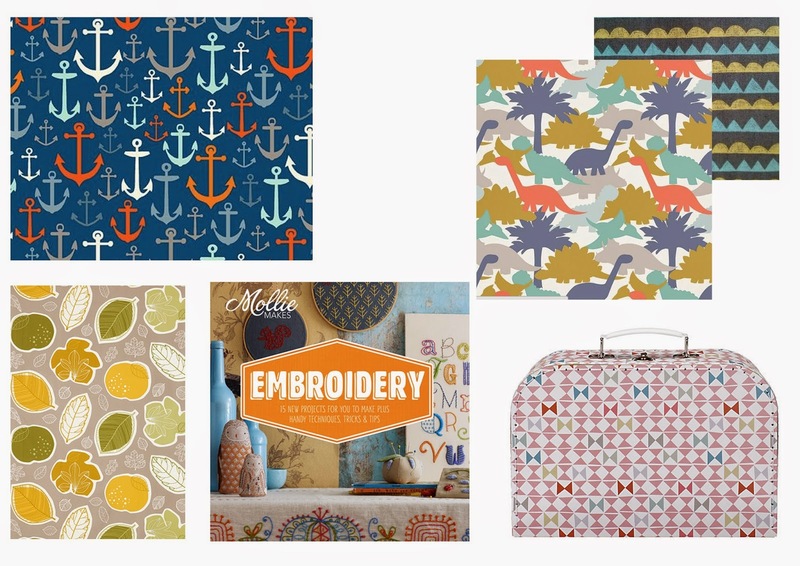 This weeks Wishlist Wednesday is all about the needle and thread. I love sewing. I'm gutted that it's taken me months to actually get my machine out since we have moved. But now we have a desk it means I can spend more time at the machine making things to decorate the house. My aim is something a month. Fingers crossed! Nautical Material (Makower) - I love this, living by the sea I love to immerse myself in all things nautical at times to remind me of being so fortunate. I would love this to make some pyjamas, cushions or a tent for Max. Jurassic Coast (Lewis & Irene) - Max is going through a real dinosaur phase (still!) and this is fantastic. I can imagine this being double sided (with the aztec pattern on the back) and made into a soft quilt for Max to have in his room for his big boy bed! Gurine (Ikea) - Ikea do amazing selections of fabrics that you can have cut in store. Our lounge is taking on a bit of an earthy browns, creams and greens so this would fit perfectly for some statement cushions in the room. Mollie Makes Embroidery book - I love Mollie Makes magazine. So this is a great addition for extra projects. I love embroidery as you can really put a flair and your own ideas into it and make it really unique. RJB Sewing Suitcase - I love the pattern on this suitcase. I want a suitcase over a box as it would be far easier to transport the things that I want to do on the go.